Below is the transcript from the first presidential debate at Hofstra University between Donald Trump and Hillary Clinton. LESTER HOLT: “Good evening from Hofstra University in Hempstead, New York. I’m Lester Holt, anchor of ‘NBC Nightly News.’ I want to welcome you to the first presidential debate. The participants tonight are Donald Trump and Hillary Clinton. This debate is sponsored by the Commission on Presidential Debates, a nonpartisan, nonprofit organization. The commission drafted tonight’s format, and the rules have been agreed to by the campaigns. 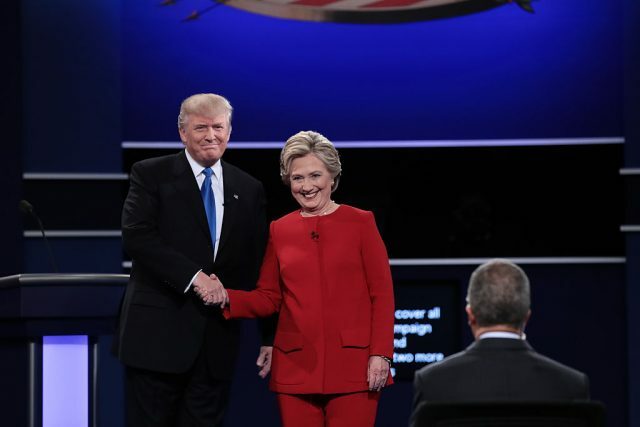 The 90-minute debate is divided into six segments, each 15 minutes long. We’ll explore three topic areas tonight: Achieving prosperity; America’s direction; and securing America. At the start of each segment, I will ask the same lead-off question to both candidates, and they will each have up to two minutes to respond. From that point until the end of the segment, we’ll have an open discussion. HOLT: “Good luck to you. Well, I don’t expect us to cover all the issues of this campaign tonight, but I remind everyone, there are two more presidential debates scheduled. We are going to focus on many of the issues that voters tell us are most important, and we’re going to press for specifics. I am honored to have this role, but this evening belongs to the candidates and, just as important, to the American people. Candidates, we look forward to hearing you articulate your policies and your positions, as well as your visions and your values. So, let’s begin. We’re calling this opening segment “Achieving Prosperity.” And central to that is jobs. There are two economic realities in America today. There’s been a record six straight years of job growth, and new census numbers show incomes have increased at a record rate after years of stagnation. However, income inequality remains significant, and nearly half of Americans are living paycheck to paycheck. CLINTON: “Well, thank you, Lester, and thanks to Hofstra for hosting us. The central question in this election is really what kind of country we want to be and what kind of future we’ll build together. Today is my granddaughter’s second birthday, so I think about this a lot. First, we have to build an economy that works for everyone, not just those at the top. That means we need new jobs, good jobs, with rising incomes. CLINTON: “I also want to see more companies do profit-sharing. If you help create the profits, you should be able to share in them, not just the executives at the top. And I want us to do more to support people who are struggling to balance family and work. I’ve heard from so many of you about the difficult choices you face and the stresses that you’re under. So let’s have paid family leave, earned sick days. Let’s be sure we have affordable child care and debt-free college. How are we going to do it? We’re going to do it by having the wealthy pay their fair share and close the corporate loopholes. HOLT: “Secretary Clinton, thank you. TRUMP: “Thank you, Lester. Our jobs are fleeing the country. They’re going to Mexico. They’re going to many other countries. You look at what China is doing to our country in terms of making our product. They’re devaluing their currency, and there’s nobody in our government to fight them. And we have a very good fight. And we have a winning fight. Because they’re using our country as a piggy bank to rebuild China, and many other countries are doing the same thing. TRUMP: “We cannot let it happen. Under my plan, I’ll be reducing taxes tremendously, from 35 percent to 15 percent for companies, small and big businesses. That’s going to be a job creator like we haven’t seen since Ronald Reagan. It’s going to be a beautiful thing to watch. CLINTON: “Well, I think that trade is an important issue. Of course, we are 5 percent of the world’s population; we have to trade with the other 95 percent. And we need to have smart, fair trade deals. We also, though, need to have a tax system that rewards work and not just financial transactions. And the kind of plan that Donald has put forth would be trickle-down economics all over again. In fact, it would be the most extreme version, the biggest tax cuts for the top percent of the people in this country than we’ve ever had. I call it trumped-up trickle-down, because that’s exactly what it would be. That is not how we grow the economy. We just have a different view about what’s best for growing the economy, how we make investments that will actually produce jobs and rising incomes. I think we come at it from somewhat different perspectives. I understand that. You know, Donald was very fortunate in his life, and that’s all to his benefit. He started his business with $14 million, borrowed from his father, and he really believes that the more you help wealthy people, the better off we’ll be and that everything will work out from there. I don’t buy that. I have a different experience. My father was a small-businessman. He worked really hard. He printed drapery fabrics on long tables, where he pulled out those fabrics and he went down with a silkscreen and dumped the paint in and took the squeegee and kept going. TRUMP: “Well, for one thing — and before we start on that — my father gave me a very small loan in 1975, and I built it into a company that’s worth many, many billions of dollars, with some of the greatest assets in the world, and I say that only because that’s the kind of thinking that our country needs. Our country’s in deep trouble. We don’t know what we’re doing when it comes to devaluations and all of these countries all over the world, especially China. They’re the best, the best ever at it. What they’re doing to us is a very, very sad thing. So we have to do that. We have to renegotiate our trade deals. And, Lester, they’re taking our jobs, they’re giving incentives, they’re doing things that, frankly, we don’t do. Now, in all fairness to Secretary Clinton — yes, is that OK? Good. I want you to be very happy. It’s very important to me. In fact, Donald was one of the people who rooted for the housing crisis. He said, back in 2006, “Gee, I hope it does collapse, because then I can go in and buy some and make some money.” Well, it did collapse. TRUMP: That’s called business, by the way. CLINTON: Nine million people — nine million people lost their jobs. Five million people lost their homes. And $13 trillion in family wealth was wiped out. Now, we have come back from that abyss. And it has not been easy. So we’re now on the precipice of having a potentially much better economy, but the last thing we need to do is to go back to the policies that failed us in the first place. Independent experts have looked at what I’ve proposed and looked at what Donald’s proposed, and basically they’ve said this, that if his tax plan, which would blow up the debt by over $5 trillion and would in some instances disadvantage middle-class families compared to the wealthy, were to go into effect, we would lose 3.5 million jobs and maybe have another recession. They’ve looked at my plans and they’ve said, OK, if we can do this, and I intend to get it done, we will have 10 million more new jobs, because we will be making investments where we can grow the economy. Take clean energy. Some country is going to be the clean- energy superpower of the 21st century. Donald thinks that climate change is a hoax perpetrated by the Chinese. I think it’s real. CLINTON: And I think it’s important that we grip this and deal with it, both at home and abroad. And here’s what we can do. We can deploy a half a billion more solar panels. We can have enough clean energy to power every home. We can build a new modern electric grid. That’s a lot of jobs; that’s a lot of new economic activity. So I’ve tried to be very specific about what we can and should do, and I am determined that we’re going to get the economy really moving again, building on the progress we’ve made over the last eight years, but never going back to what got us in trouble in the first place. Now, look, I’m a great believer in all forms of energy, but we’re putting a lot of people out of work. Our energy policies are a disaster. Our country is losing so much in terms of energy, in terms of paying off our debt. You can’t do what you’re looking to do with $20 trillion in debt. The Obama administration, from the time they’ve come in, is over 230 years’ worth of debt, and he’s topped it. He’s doubled it in a course of almost eight years, seven-and-a-half years, to be semi- exact. So I will tell you this. We have to do a much better job at keeping our jobs. And we have to do a much better job at giving companies incentives to build new companies or to expand, because they’re not doing it. And all you have to do is look at Michigan and look at Ohio and look at all of these places where so many of their jobs and their companies are just leaving, they’re gone. And, Hillary, I’d just ask you this. You’ve been doing this for 30 years. Why are you just thinking about these solutions right now? For 30 years, you’ve been doing it, and now you’re just starting to think of solutions. And now you want to approve Trans-Pacific Partnership. You were totally in favor of it. Then you heard what I was saying, how bad it is, and you said, I can’t win that debate. But you know that if you did win, you would approve that, and that will be almost as bad as NAFTA. Nothing will ever top NAFTA. TRUMP: You called it the gold standard of trade deals. You said it’s the finest deal you’ve ever seen. TRUMP: So is it President Obama’s fault? CLINTON: … before you even announced. TRUMP: Is it President Obama’s fault? CLINTON: There are different views about what’s good for our country, our economy, and our leadership in the world. And I think it’s important to look at what we need to do to get the economy going again. That’s why I said new jobs with rising incomes, investments, not in more tax cuts that would add $5 trillion to the debt. CLINTON: But in — oh, but I do. CLINTON: But it’s because I see this — we need to have strong growth, fair growth, sustained growth. We also have to look at how we help families balance the responsibilities at home and the responsibilities at business. TRUMP: “You are going to approve one of the biggest tax cuts in history. You are going to approve one of the biggest tax increases in history. You are going to drive business out. Your regulations are a disaster, and you’re going to increase regulations all over the place. And by the way, my tax cut is the biggest since Ronald Reagan. I’m very proud of it. It will create tremendous numbers of new jobs. But regulations, you are going to regulate these businesses out of existence. TRUMP: “No, no, you’re telling the enemy everything you want to do. CLINTON: “No, we’re not. No, we’re not. HOLT: “OK, you are unpacking a lot here. And we’re still on the issue of achieving prosperity. And I want to talk about taxes. The fundamental difference between the two of you concerns the wealthy. TRUMP: “Well, I’m really calling for major jobs, because the wealthy are going create tremendous jobs. They’re going to expand their companies. They’re going to do a tremendous job. I’m getting rid of the carried interest provision. And if you really look, it’s not a tax — it’s really not a great thing for the wealthy. It’s a great thing for the middle class. It’s a great thing for companies to expand. And when these people are going to put billions and billions of dollars into companies, and when they’re going to bring $2.5 trillion back from overseas, where they can’t bring the money back, because politicians like Secretary Clinton won’t allow them to bring the money back, because the taxes are so onerous, and the bureaucratic red tape, so what — is so bad. So what they’re doing is they’re leaving our country, and they’re, believe it or not, leaving because taxes are too high and because some of them have lots of money outside of our country. And instead of bringing it back and putting the money to work, because they can’t work out a deal to — and everybody agrees it should be brought back. Instead of that, they’re leaving our country to get their money, because they can’t bring their money back into our country, because of bureaucratic red tape, because they can’t get together. Because we have — we have a president that can’t sit them around a table and get them to approve something. And here’s the thing. Republicans and Democrats agree that this should be done, $2.5 trillion. I happen to think it’s double that. It’s probably $5 trillion that we can’t bring into our country, Lester. And with a little leadership, you’d get it in here very quickly, and it could be put to use on the inner cities and lots of other things, and it would be beautiful. CLINTON: “Why not? Yeah, why not? HOLT: “This is — this is Secretary Clinton’s two minutes, please. CLINTON: “… as I said, trumped-up trickle-down. Trickle-down did not work. It got us into the mess we were in, in 2008 and 2009. Slashing taxes on the wealthy hasn’t worked.